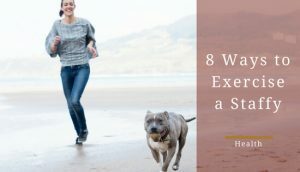 As we all know, springtime has just arrived (at the time of writing) and with it comes a variety of things that might stir up your staffy’s allergies. However, allergies aren’t only prone to flare up during the springtime; it can happen all year long. With this in mind, it’s important to understand the things that might cause your staffy’s allergies so you can limit their exposure to those triggers. 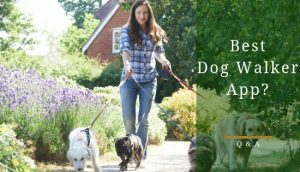 In fact, this article’s going to go over all the things you need to know about allergies just in case your dog does end up being prone to allergic reactions. Just like with humans, allergies are immune responses to environmental substances that can cause your staffy to become sick and miserable. Prolonged exposure to these substances, which are called allergens, can make your staffy’s immune system extremely sensitive and cause an over-reaction. Basically, everything we hate about allergies as humans, your staffy does too. Allergies are extremely frustrating and annoying to deal with for your pup thanks to the symptoms that can arise from having an allergic reaction. Itchy, or scabbed skin. See our article on dog skin conditions. All of these are common signs that your staffy could be having an allergic reaction to something they’ve encountered in their environment. These symptoms occur when your dog’s immune system starts to perceive every day, usually harmless, substances as dangerous. 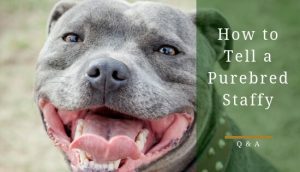 In response to the symptoms, you need to make sure the issue doesn’t get severe enough that it makes your staffy’s life extremely uncomfortable. If the reaction does get too severe, your staffy might encounter a secondary issue such as a bacteria or yeast infection, which might cause hair loss, scabs or crusty skin. 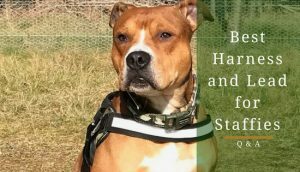 For these reason, it’s crucial to notice these symptoms early, before they get worse and your staffy gets more exposed to the allergen causing the reaction. 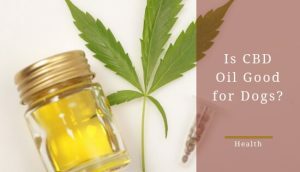 As you may know from personal experience, there’s nothing worse than having an allergic reaction that leaves you feeling sick and uncomfortable. Sadly, it’s the same for dogs and that’s why it’s important to do anything you can to help them avoid having a reaction. Of course, not all dogs are going to be allergic to each of these things. If you suspect your dog might be allergic to any of the things below, there are steps you can take to prevent a bad reaction occurring. 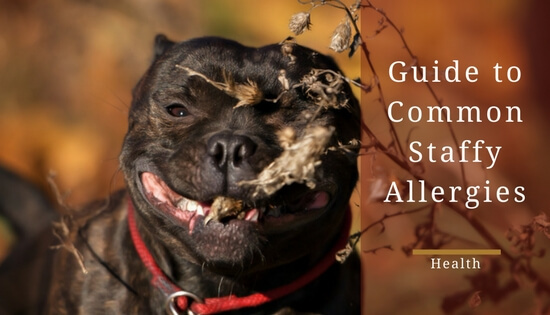 Unfortunately, there’s not much you can do to stop allergens such as pollen, dander, or grass from making your staffy have a reaction if they are allergic since they are an abundant part of nature. Unless you completely stop taking them outside (don’t do this), they’re not going to stop encountering them. Wiping your staffy down with a damp towel every time you bring them in from outside. Giving them a bath with hypo-allergenic shampoo. Spraying your staffy fur’s with a coat cleansing spray can help remove dander particles and reduce irritation. Fur Cleansing spray Click to view on Amazon. Benadryl can also help but don’t give it to your staffy without consulting a vet beforehand. Giving your staffy fish oil ​like this one on Amazon. 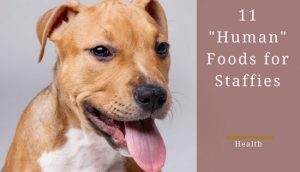 Now, if you think your staffy has a food allergy, you need to find out what it is they are allergic to. To do this properly, you can consult a vet about a hydrolysed protein diet for a period of 12 weeks. The diet is used to eliminate all potential allergens before slowly reintroducing their regular foods to find which food they are sensitive to. During this 12-week period, it’s imperative to resist feeding your staffy anything outside this diet: no treats, or table scraps. Most likely, this diet will require some home cooking on your part. Your staffy will remain on this diet until their symptoms go away then you can slowly introduce their old foods to determine the cause of the reaction. 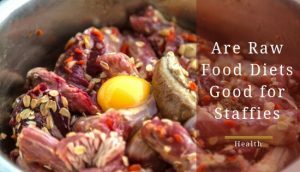 It may seem like a long period of time but it is worth going through with it; it will make you a lot more comfortable regarding what you should and can feed your staffy. Preventing a dust allergy is easy; you just need to make sure to clean all your staffy’s bedding at least once a week. In addition, regularly vacuum around your house and anything that’s likely to collect dust such as carpets, rugs, or curtains. The downside is, just like pollen or a grass allergy, dust is pretty much unavoidable, and your main course of action is preventing as much exposure as possible. Moreover, a dust allergy is different from the others because it will cause your staffy’s symptoms to include runny eyes and nose, a cough, and possible wheezing. During warmer months these pesky little things become a real problem. It’s important to consult your vet and start your dog on a flea-control program before the fleas come back in season. If you have multiple pets, make sure to start them all on a flea-control program because pets can pass fleas to each other. A regular flea protection product like this one can help to kill fleas and keep them away from your dog. Taking these measures are very simple and can save a lot of trouble for you and your pup in the future. If you feel like you’ve tried everything and the reactions just keep getting worse over time, contact a vet about corticosteroids; they can be an effective short-term solution to help reduce allergy symptoms. This is only a short-term solution because there can be permanent, long-term side effects of prolonged steroid use. These steroids are helpful for removing the symptoms and making your dog comfortable but will not cure the problem. You can purchase a kit through an online testing company who will then test your dog’s sample, which is usually a saliva sample that you post to them, to see what they may be allergic and sensitive to. This method is very convenient, simple and not too costly. It is a good way to find out just what could be causing your dog’s reaction, so you can remove that substance. Another allergy testing method can be done at the vets. It is done the same way it’s with humans; your staffy will be injected with allergens along with a positive and negative control. If a reaction does happen, a welt will appear 15 minutes after the injection. If necessary, following this kind of test, your dog can be prescribed regular allergy injections. Unfortunately, it’s a slow moving process that takes up to six to nine-months to even start seeing results. The good news is that these kind of allergy shots have an 80% success rate and should be considered a real option for staffy owners that have run out of options. Using the information in this article, you should now be aware of the signs, causes and how you can manage them. And it is managing them that’s the key. You must be aware that allergies cannot be cured so they need to be managed as best you can to avoid bad reactions. 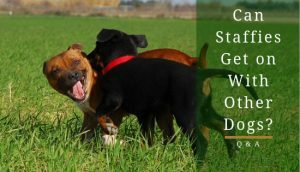 By being pro-active and finding out the causes as quickly as possible, you will be able to take the appropriate action to keep your staffy comfortable and in good spirits.